Sully Ratke is a costume designer, an illustrator, a painter, a poet, a composer, a pianist, a sculptor, and a puppeteer. She received her undergraduate degree from The University of Notre Dame in 2010 where she majored in Painting and Drawing, and Italian. She spent a year outside of Florence as a child and another in College, studying at the University of Bologna, retaining a strong connection to her Italian roots, Italian language, and traditional Western European art culture. Her parents’ passion for anthropology and her father’s career as an historian of Comparative World Religions provided her with a fascination for all peoples and an intuition for connecting them - particularly through their common use of symbols, rituals, and spiritual ideas. 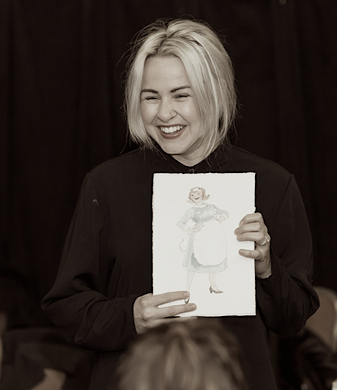 A performer in visual arts, theatre, and music throughout her young life and an intense love of poetic literature led her to a career in Theatre Making - and a graduate degree from Northwestern University’s MFA program in costume design. Based in Chicago, she continues to design professionally, And teaches Design and theatre-making at The university of Chicago and North central college.